Am südöstlichen Ende des St. Thomas, befindet sich der private Strand von Cowpet Bay. Unsere Villa ist umgeben von üppigen tropischen Pflanzen umgeben und bietet einen weiten Blick auf die umliegenden Saphir Meere und die benachbarten Inseln. Ob Sie sich für eine intime Island Hideaway oder eine gut gelegene Ausgangspunkt, von dem her auf Abenteuer und exotische Erkundungen gehen suchen, ist unsere Cowpet Villa für Sie. Strand Cowpet bietet Schwimmen, Schnorcheln, Sonnenbarsch Verleih und Kajakfahren. Stühle und Liegen sind vorhanden, zusammen mit viel Sonne oder im Schatten unter den Palmen säumen den Strand. Unsere Villa ist geräumig für ein Paar, geräumig für zwei Paare oder eine vierköpfige Familie geeignet. Die Aussicht ist sensationell! Ein Meer Galerie bietet eine Open-Air überdachten Balkon mit beiden Mahlzeiten im Freien für vier und bequemen Sitzgelegenheiten, von dem an die verstreuten Inseln St. blicken James, St. John und Tortola. Die britischen Inseln sind unsere Nachbarn und Wasser-Taxi-Services, Bootsverleih, oder Fähren können leicht zu transportieren, Sie in ihrem nahe gelegenen Ufer. Cowpet Bay befindet sich nur wenige Gehminuten von der Karibik-Fischmarkt, einem Open-Air-Restaurant am Strand, das Frühstück, Mittag- und Abendessen und Sangria Strandcafe befindet. Das elegante Resort Hotel The Ritz Carlton, ist auch zu Fuß erreichbar. Im nahe gelegenen Dorf Redhook ist nur wenige Minuten mit dem Auto entfernt, wo Angeln Charter, Bootsverleih, Restaurants, Bars, Märkten und bieten Zugang zu allen Annehmlichkeiten. Fangen Sie die Fähre verlassen jede Stunde von der Redhook Dock für einen Tag oder Abend voller Spaß am St. John. In der Innenstadt von St. Thomas, der Stadt Charlotte Amalie entlang der Uferpromenade gelegen, bietet die aufregendsten Einkaufsmöglichkeiten in der Welt, in der Zollfreiheit gewährt bemerkenswerte Preis für Schnäppchenjäger der besten Namen in Kristall, Porzellan, Schmuck, Uhren, Kameras, Kleidung und mehr . Eine 15-minütige Fahrt vom Cowpet führt Sie zu den spektakulären Mahogany Run Golf Course zu nehmen. Cliff-Side-Tee-Boxen, tropische Wälder, Seen, und unvergleichlichen Blick auf das Meer schaffen eine dramatisch anspruchsvolle, 27-Loch-Platz für Ihren Genuss. Wir wissen, dass Sie Ihren Inselurlaub in unserem spektakulären Villa am Meer zu genießen. We had a great stay in St Thomas!!! We enjoyed our stay at this condo very much. The owner made it easy to rent and instructions were given ahead of our arrival on how to get in the condo. The two bedrooms were quite spacious and comfortable. Everything that you needed was provided such as plenty of beach towels to kitchen supplies. We didn’t do any cooking but it looked like the kitchen was well equipped with what you would need. The best space was the balcony which was a good size with five chairs as well as a table and chairs. We spent a lot of time there just looking out at the fantastic view of St John and some other islands as well as having our breakfast outside every morning. The beach is small but there were always plenty of chairs available in the sun or shade. There is a lot of coral in the water so water sandals are helpful. We enjoyed going to Megan’s bay as well as taking the ferry over to St Johns for the day to swim at Trunk Bay which is also a beautiful beach. Lots of good restaurants in Red Hook which is a short drive away. The roads are narrow and quite hilly and you have to drive on the left side of the road but you really need to rent a car unless you want to rely on taxis. We were supposed to go to St Thomas last Christmas but due to the hurricanes we had to cancel our plans. We decided to return this year. You could see a small amount of damage still around the island but most stores and restaurants have reopened and all of the foliage has grown back on the trees and plants so you don’t have to worry at all. Most store clerks and restaurants have said that there business hasn’t returned to pre hurricane levels so I am sure the island would appreciate your business! We loved our stay in Carla's beautiful condo. The beds were super comfortable and the furnishings were great. Loved the architectural details of the building with the arched doors and the big solid bedroom doors. The balcony was super big with the best view. We had a wonderful dinner on the balcony one evening. Did not get to use the bbq grill but would have loved to grill out if we had the time. Marcella the housekeeper was very friendly and accomodating as well. The restaurants in the complex were awesome. The grocery store in Redhook had everything you could want probably twice the cost of the US though. There was another food store west on 32 heading to the airport that I heard was less expensive. The grounds were beautiful the only drawback is they don't have privileges to the pool at the Elysian although our sister was staying there so we piggybacked into the pool with her key. Great pool bar and the bartender David was very informative. The ferry to St John was convenient and well worth the price to visit the island. We took the car ferry and the only caveat is returning you may have to wait since the ferry gets busy at around 4 pm. Would highly recommend Carla's condo and she was very responsive by email if we had any questions, we would love to return if we have the opportunity. Clean, quiet, with a perfect view! We are so glad we stayed in Red Hook, instead of Charlotte Amalie. This villa has old furnishings and eclectic decor, but was clean, extremely quiet, and has the perfect view from the porch. If you are looking for simplicity and something less expensive, than this place is for you. We were disappointed only one room has an ocean view, but Carla let us know that in advance. We enjoyed the small bit of beach at the base of the villas. The grounds are beautiful. Carla was very receptive to questions with fast responses. The house is set up well for families with children, or a couples getaway like we enjoyed. Thoroughly enjoyed our stay here. Best for families as opposed to romantic getaways. Beautiful condo with amazing views! Spacious and well kept. Me and my husband loved this property it was so close to the beach. We will be going back!! This was our second time staying in Cowpet Bay and it was lovely yet again. The beach is close by and there are a couple places to eat if you don't want to wander too far away. The condo has everything you need, including a pack and play for younger children. It was very spacious with everything you need. The view of the bay is beautiful and so relaxing to wake up to. Will definitely look forward to coming back next year. Cowpet is our favorite location to stay on St. Thomas, and this condo is tastefully equipped with everything you need for a stress-free island vacation! 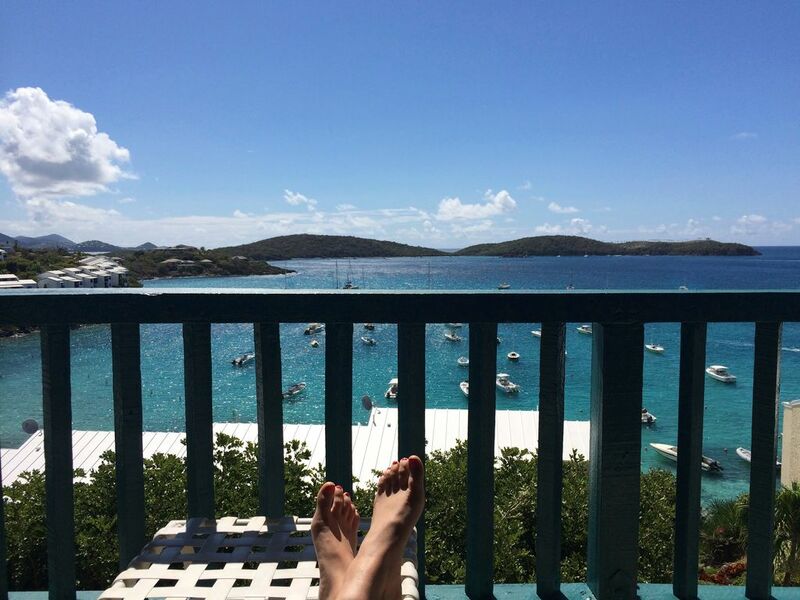 This is our second time renting this unit, and it will definitely be at the top of our list the next time we are lucky enough to vacation in the USVI. Owners are very friendly and accommodating. The grounds of the resort complex are beautifully manicured, staff at the nearby restaurant/bar were friendly and helpful with recommendations. Cowpet is ideally located for those vacationers who wish to visit the nearby restaurants and shops in Red Hook and very convenient for ferry-goers wishing to go to St. John.